The Rambles of Nuggetstump | travel, beauty, fashion, books and a bit of everything else! Here we are again with another Psoriasis post! It turns out that the last time I wrote a blog post about my Psoriasis was at least two years ago, which is crazy! How has the time gone by so far already? Anyway, getting into the post..
As some of you may know, I have suffered with Psoriasis since I was around the age of 7 or 8. I first noticed this when I was in school, it was raining outdoors and in class, I realised that my skin was really sore. I went to the bathroom and being a 7 year old child, what do you do? Throw some hand wash over your face, wash your face and hope for the best! Obviously, I did not know that I had Psoriasis and putting soap on my face was probably the last thing I would ever do now. So, I had a VERY red forehead and hairline when I went home and that’s when I went to the doctors and HOORAH, it’s Psoriasis..
What is Psoriasis some of you might ask? Well, Psoriasis is a skin condition that you cannot cure. Your skin tends to become really red, inflamed, it can flake, become very itchy, weep and just look pretty gross to other people. It is not contagious, so do not worry! My Psoriasis is a lot milder than other peoples. Unfortunately, some people can get this all over their bodies, where it cracks, bleeds and is debilitating them from movement. Nobody knows, but basically your body is producing skin cells much quicker than it usually would. So think of it, you are getting an extra layer of skin, on top of your regular skin (technically it gradually moves up through the layers of skin) and hence why it flakes. What can cause a flare up of Psoriasis? It is said that a number of things can trigger Psoriasis such as stress, smoking, drinking excessive amounts of alcohol, throat infections, other immune disorders and even hormonal changes. Some people even think that certain foods can really trigger their Psoriasis, but that’s another boat to go into, so maybe another time I’ll write up about that! What do I do to my Psoriasis to keep it at bay? I am quite lucky with my Psoriasis, it is mainly in my scalp, behind my ears, can flare up around my T-Zone, neck and eyebrows. Luckily, mine can be quite unnoticeable until it flares up. When this happens, I will usually use a Cortizone cream which is a steroid cream (I believe this is called Hydrocortizone in the UK, you cannot get this over-the-counter). I don’t particularly like using these especially as you shouldn’t use them on your facial skin (there is a reason for it) but I find that this works for my skin when it’s a mini-emergency to really calm it down. On a day-to-day basis, I will leave my skin alone pretty much. I do not put any ointment on it, I just try to go about my day with a normal moisturiser and in the night, I will cleanse my skin with pure Coconut Oil (comes hard, so needs to be left to melt in your hand into an oil) and then I will apply some more onto the flakier parts of my face. This has been a recent discovery of mine and so far it is going really well, it has left my skin really soft, no flakes and so far, I am not worrying about ‘When am I going to flare up?’. I do not wear foundation or moisturisers that have a huge amount of chemicals in them. I like to keep my skincare quite simple as I don’t really see the point in putting all stuff that I don’t know about into my skin. Surely it’s not great for the skin, right? Photos from 2015 – Psoriasis flaring up behind the ears, neck, scalp and T-Zone. Some people believe that the sun can really clear up cases of Psoriasis, but from my personal point of view for me it doesn’t really work. If anything, it aggravates my skin and causes it to flare up. I have known many people that really benefits from the sun though, so it’s just down to the each individual. Other people resort to Steroid Creams or Ointments to nourish the skin daily. I also know a few people that go for Phototherapy, this is when your skin is exposed to a special type of UV light and it can really clear up the Psoriasis. I have also heard that people can take tablets and injected medication for Psoriasis, but I personally don’t have any experience with this at all. It’s all really trial and error for your own personal needs and it can take some time, but when you’ve found a routine that your skin likes stick to it! I have also heard that some tea’s can help with Psoriasis too such as Rooibos Tea, Ginger Tea.. Here is a link to Beautymunsta’s Blog where I found this article on the Best Tea’s for Psoriassis! *Disclaimer: I am not under any Medical Profession at all. My words are purely from my experience, for further information contact your local GP. That’s right, I’m almost certain you know what 13 Reasons Why is all about now! If not, Netflix have recently released a TV Series based on the book 13 Reasons Why by Jay Asher and believe me, it does not disappoint! There has also been a lot of hype about it so far which I feel so proud about as I read this book two years ago and it really hit me hard. Basically, 13 Reasons Why by Jay Asher was released in 2009 and is a story about a teenager girl called Hannah who has committed suicide. People aren’t too sure why she has done this, especially her parents but 13 of her high school friends have received a cassette tape that she’s recorded especially for them. These tapes include a lot of information on how things happened from her point of view. Some people might not have thought they were responsible or contributed to her death in the slightest, but when they hear her side of the story you can really see how it all builds up. She takes them individually to certain locations and tells them the background story of that place and what incidents happen there. There is a lot of emotions that will run through you in this book and I could not put it down whilst I was travelling. I find that there’s some really, really crucial and important points within this book and I would love teenagers to especially understand them. People do not realise how much harm they are doing to somebody. They might think it’s just a small remark or joke, but that person could take it differently, could be dealing with several other issues at the time or just really having a tough time itself. In this book, it brings across the point to the other students that you might have done something ‘small’, but really that all added up and contributed to the death of Hannah. I highly recommend giving this book a read, it might really open your eyes to the way others think and share the word around about this great book! You can purchase this book from Amazon or Waterstones and several other book stores. Do you want to follow me on Goodreads? Here’s a link to my profile. Don’t know what Goodreads is, but you love reading? It is pretty much the Facebook of Reading Books. You can add yours friends to it, create your own personal profile where you can update your ‘status’ saying what books you are reading, what page you are currently on (it calculates a percentage of your progress through the book) and you can do so much more on there. There’s competitions from authors themselves to win signed books, there’s groups to join, you can create and join lists of your favourite books and specific genres and even join Book Clubs. Don’t forget that Goodreads have a ‘Reading Challenge’ every year, where you can set yourself a target of how many books you would like to read throughout the year and it will add them all up for you as you go along! So, I hope you enjoyed the review and let me know if you have or want to read the book and if you’ve seen the TV Series adaptation! What do you think about the book/series? Does any of this really hit home to you in some sort of way? – What am I looking forward to on Netflix 2017? That’s right, Easter has come around again and another year has passed, which can only mean one thing that’s coming up: Reduced Cadbury Creme Eggs! But before we can get to that, we are on the run up to Easter and this year I thought I would write a few small Easter-based posts for you all! I don’t usually celebrate Easter that much and I’m usually so busy that it just flies by (and come on, Easter Eggs were in stores on my birthday this year which was January 2nd).. So, what am I munching on this Easter? Am I going traditional? Experimenting and branching out more to new things? Firstly, what is the Easter Holidays without Cadbury’s, right?! That is just completely uncalled for. So I am starting my easter off with some good ole, traditional Creme Egg Easter Eggs and a Mini Eggs variation also (I am sharing these with my boyfriend, I’m not being super greedy!). Then, I was kindly sent a bar of Cadbury’s Dairy Milk ‘Peanut Caramel Crisp’ which looks just so, so good! I haven’t seen this in any of my local stores yet, so I am really excited to try this. My parents recently came back from Florida and they very kindly brought us back some goodies from America! I have never seen these before and just didn’t even think of what products are in the US for Easter. Question for my American readers: Do you have Easter Eggs? My parents only saw one and it was tiny! They brought us back a selection of Reese’s Easter range such as the White Peanut Butter Egg, which is similar to a original peanut butter cup, but is in the shape of an egg (Hence the name, pretty straight forward!). I have eaten one of these already and they are so, so tasty! *Unfortunately*, it turns out that my boyfriend doesn’t like Peanut Butter, so I get to eat his share.. They also brought back a Reese’s Rabbit which I am assuming is like a Peanut Butter Cup but in the shape of a bunny? I haven’t tried this one yet but I’m really excited and will update you all on what I thought! Then lastly, there’s the Reese’s Pieces Eggs which look amazing! Think Mini Eggs.. but filled with peanut butter and possibly chocolate.. How incredible is that, right?! The packaging is so adorable also with it’s cute spring time colour theme and little chicks all around! I really cannot wait to get stuck into these, but I want to save these until last to savour. 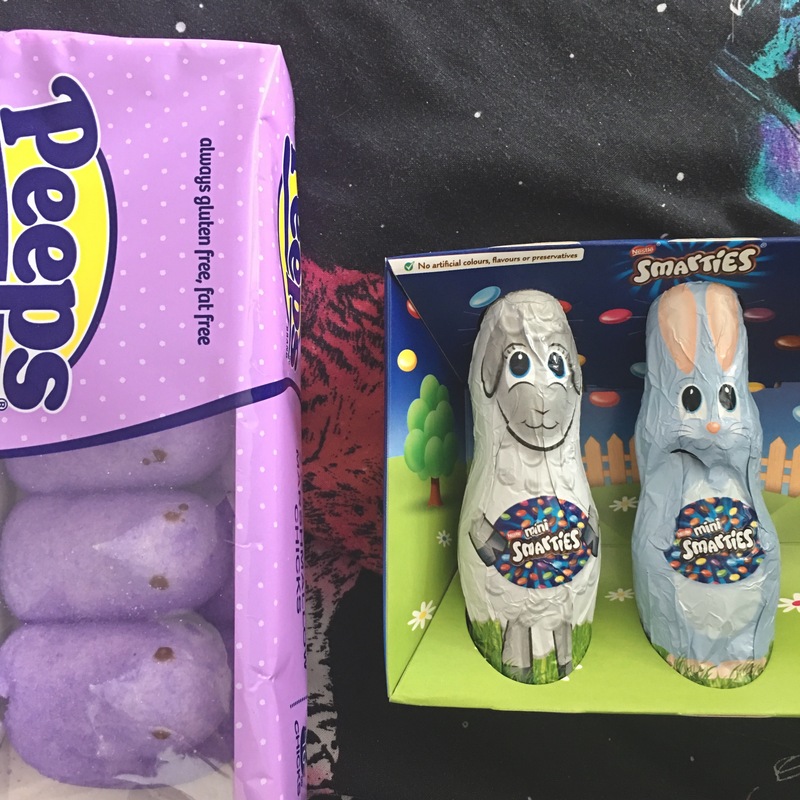 When I went back home to visit my family, my parents also picked up some Mini Smarties animals, which I am assuming are filled with Mini Smarties which are so good! I love the packaging and how cute they have made these festive animals – I am going to be slightly sad when I demolish them though! I will probably be posting another Easter post for you all which will be all about ‘What To Do This Easter’, so I look forward to showing you all! What is your favourite Easter egg of all time? Mine has to be simple and classic like Cadburys with creme eggs. So, somehow another month has passed by which means it’s time for another monthly favourites! I was so busy in February that I completely forgot to do a favourites and when I did, it was already March.. so here’s a March Favourites instead! I am going to save the blabbing this time and just get stuck right into it. My first favourite of the month of March certainly has to be Netflix. I have finally re-entered the fabulous world of Netflix and wowie, there are so many incredible shows for me to catch up on! There is nothing better than jumping into bed early to catch up on Netflix and munching on way too many Minstrels! I have written a post on What I’m Looking Forward to on Netflix 2017 (This might feature 13 Reasons Why – which is another monthly favourite for me! Hype hype!) for you all to check out, if you need some inspiration! I was so fortunate to attend a Netflix Event in Cardiff last month, where there was a Netflix-filled apartment and we got shown all of the latest releases coming for 2017. Here is a link to that post, incase you want to give it a read: My Time at the Netflix Apartment. My first favourite of March has to be the Nyx Brow Gel in the shade ‘Chocolate’ (seen in the photo above). Seriously, it is pretty tough to rub these bad boys off whilst I have this brow gel on my eyebrows! I was looking for a product that doesn’t wipe away easily like pencil or sometimes powder (I also have psoriasis, so I tend to scratch pretty often) and this product works a treat. I apply this brow gel with an angled eyebrow brush from Real Techniques, I try not to apply too much as they can go a little too bold and dark for my face but if I apply carefully, they go with my hair colour pretty well. You can purchase this from select Boots stores, so here is a link to the website for you to browse. I will most probably do an eyebrow tutorial on my blog using this product for you all soon! Let me know what you think about that. “Would you risk your life to save a stranger? Discover what happens next in the Sunday Times bestselling psychological thriller, Dear Amy . . .
I’ve been kidnapped by a strange man. This must be a hoax. Because Bethan Avery is another young girl, who went missing twenty years ago. As more letters arrive, Margot becomes consumed by finding the sender and – unlike the police – convinced that the girls’ disappearances are connected. You can purchase this book from Amazon now! My third favourite is Bath and Body Works ‘Twisted Peppermint’ foaming hand wash which is a Christmas Fragrance. I absolutely adore Bath and Body Works and I am so, so, so sad that there isn’t one in the UK (although, if there was, it would probably be expensive..) so when I go to America I go a little crazy on the hand soaps and antibacterials! I cannot get enough of them! I was super excited as I have heard about the Christmas Fragrances that come out obviously over the Christmas period, but I have never been in America late enough for them to be released, so this Christmas I found them and I was super excited! Unfortunately, I really wanted the Body Mist of this as it was really gorgeous but it was sold out completely in the store I went to and could not get my hands on it! Damn! I would highly recommend these products and if you haven’t heard of Bath and Body Works then definitely give them a browse – there’s no doubt that you won’t find something that you will fall in love with! I have also been loving The Library of Fragrance‘s scent in ‘Honeysuckle’. I purchased this from Boots for £10 (usually £15) with my Advantage Card points to treat myself and my, my, my.. this genuinely smells like actual flowers! Although, my boyfriend just comments ‘You smell like a bee’ (whatever a bee smells like.. but y’ano). This company have so many different fragrances from Cinnamon, Marshmallow, Mint Ice Cream, Fresh Laundry and even Play-Doh.. that’s right, Play-Doh.. yummy?.. You can even mix and match scents, and they have a page that tells you which scents compliment each other whether you want to go warm, musky, bright and refreshing..
I’ll leave a link to their website here and also check out the Boots website as either one of the sites usually have an offer on! So, that is all I have for my March Favourites at the moment. I hope you enjoyed and I would love to know what you have been loving this month too! Let me know down below! Want to browse some more blog posts? I am always looking for new TV Series, Films and new YouTube channels to watch whether it’s on Netflix, Channel 4 or YouTube, where I can really get stuck into and become obsessed! So I thought that I would love to share my recent favourite TV Series and Films with you guys! Let’s get started by saying that I have now decided to restart the whole Gilmore Girls series. I have always just ended up watching random episodes that come on the television but never in order! And now, I am making progress and am currently on Series 2 Episode 13 (this has probably changed since I wrote this) and going strong! Let’s jump along with the hype itself, that is 13 Reasons Why. I cannot tell you how excited I have been for this series to come out! It is based on a book by Jay Asher called 13 Reasons Why, where a girl in high school commits suicide and leaves 13 different cassettes for 13 pupils at the school. I won’t tell you any more about it, but head on over to my other post ‘What I’m looking forward to on Netflix in 2017’ where I go more into depth! The next favourite is definitely Once Upon A Time. This has been a huge favourite of mine for the 10 months and I really didn’t think that I would enjoy it, but I fell in love since the very first episode and now I am on Season 4! This week I have started to watch Broadchurch as everyone has been telling me how good it is and that it has made it’s return onto itv! So, here I am having a dabble at Broadchurch thinking that it could be interesting but really hoping that I am not disappointed by the hype. NOT THE CASE. I have now watched the whole first series in two days and I am loving it! I would highly recommend this if you love crime and mysteries! I love trying to work out who has killed who, who has been going behind someone else’s back, who is lying..
My fourth choice would be American Crime Story: The People v. O. J. Simpson and again, I became addicted to this straight away! I watched the first episode and had to watch another four back to back. I really enjoy watching things that are factual or based on real life situations and this just really fascinated me and seeing how he could’ve got away with so much in his lifetime! My guilty pleasure is going to be number 5 on this list.. Made In Chelsea (You can watch every single episode on All 4). I haven’t watched this for the last two years and all of a sudden I saw an advert saying that there’s a new baby on the way and just had to catch up right away. This is one of my programmes that I really enjoy to watch, but I leave it until when my boyfriend is in work so he doesn’t complain about everything, every second haha! Does anybody feel the same way about this? I just love watching it! I think I will take a slightly different route this time with what I am watching and I will share my recent Youtube love. Again, I went travelling for 16 months and didn’t watch YouTube properly since, so I have really been getting back into it again recently and that is going back old school with Alfie Eyes (PointlessBlogVlogs), Zoe Sugg (Zoella) and Rhiannon Ashlee (RhiannonAshleeVlogs). I just love watching vlogs especially, it sounds really boring when I explain it to people that don’t understand why I watch them, but watching people’s every day lives is weirdly interesting to me..
Not forgetting that I adore watching gorgeous little Delilah (Rhiannon Ashlee’s baby girl) in the vlogs and seeing her grow up. I don’t have children, am I excited to have some? Yes, but I am definitely not having any for quite a long time yet! I adore watching family vlogs, baby vlogs, pregnancy vlogs and reading ‘mummy blogs’ too – people might think that that is weird, but I have actually met quite a few people that feel the same way recently! So there is a huge insight to what I have been watching recently and I feel like I would enjoy doing more of these in the future! I hope you enjoyed this post and my recommendations and don’t forget to send me yours too! What’s on my Beauty Wish List? What I’m Looking Forward to on Netflix 2017? People tend to ask me how do I go to Walt Disney World twice a year, and I am forever explaining mine and my families methods so I thought I would share some of our tips to you lot! We are huge Disney fans and we have such a huge passion for the Disney Parks, especially Walt Disney World. When we visit the parks, we always find more hidden facts about the park, we like to hunt down Hidden Mickeys (I’ll leave a link to explain these here) and get up to date on the latest construction of lands and rides within the parks! 1. Annual Passes – that’s right, Walt Disney World have an annual pass option when it comes to tickets which works out as very beneficial to US residents and especially Orlando visitors. It is such great value and you definitely can get your money’s worth out of this ticket. Here is a link to all the information on Annual Passes. The tickets are $829 this year, I believe and in the past years this has definitely been beneficial for us with the exchange rate of GBP and USD. When you usually go to Walt Disney World, you will pay at least £299 minimum for a 14 day ticket (and more, if it includes the Water Parks). As we go at least twice a year, it use to work out as you either break even, save slightly or have saved quite a bit of money from having the Annual Pass. If you already have a 14 day ticket, you can always upgrade your passes at the parks to an Annual Pass. 2. Cheap Flights and Accommodation – We tend to go through a travel agent in the past on icelolly.com and usually end up travelling with purpletravel. These fly with Virgin and Thomson I believe and they have some incredible packages! So definitely give them a browse on ice lolly.com and purple travel through ice lolly. We tend to get flights and accommodation for £450-500pp for two weeks with luggage included and then we rent a car on top of that which is must easier for us. 3. Non-Disney Accommodation – We think of it as ‘we get up super early in the mornings and don’t come back until midnight each night whilst at Walt Disney World. So does it really matter what hotel you have? As long as it is decent, clean, has the necessities that you need and isn’t too far from the parks then it’s great! The Disney hotels are really great and are so lovely to go to. We stayed at the All Stars Movie Resort when I was 7 years old, but it does really bump up your holiday price unless you can find an amazing deal! We tend to stick with one of our favourites now which is Celebration Suites in Old Town, Orlando. It is a 5 minute drive to Walt Disney World or maybe even less! You drive straight out of the hotel, down the road for 60 seconds and you’re straight onto the right entrance for Walt Disney World! At the Celebration Suites, depending on how many of us are going we usually get one bedroom, a kitchen, bathroom and a living area that has a pull-down bed or if you go for the deluxe rooms, you will get three bedrooms, a kitchen, two bathrooms and a living area. It is so affordable here and we are always going back, unless we feel like going somewhere different and have found an amazing deal with the Radisson Blu Celebration which is also such an incredible hotel but a bit more pricey again! 4. Food – We don’t go crazy on food at the parks as we know that they can be very expensive, so we usually eat a huge breakfast at iHop or Golden Coral before we head to the parks. We are so full from having a huge buffet breakfast, that we don’t want to eat again until the evening! Some nights, we might still not feel like a huge meal so we will get something small to eat in the parks or a snack. I also completely adore Taco Bell, it is suppose to be Mexican food although Americans tend to say it’s the ‘McDonalds of Mexican’ food but I love it and it’s super cheap and affordable when you order a snack box! Every now and then, we really enjoy visiting Tony’s at the Magic Kingdom especially as we usually go to WDW when it’s Father’s Day or somebody birthday! 5. Souvenir Cups – Take advantage of some of the souvenir cups that WDW and Universal sell. In the past, Universal use to sell a red tall cup that was $10 and you could get unlimited refills for just $0.99 each time! But, there was never anything saying that you couldn’t reuse the cup so people would always take them back each day and it was ALWAYS a huge must for us to remember our cup each year to go into the suitcase! Usually Orlando Informer‘s website always has the ins and outs of everything and provide so many amazing tips and I would recommend going over to TheTimTracker’s YouTube for more tips and videos on updates at the parks! 6. Annual Passholder Discount – If you own an Annual Pass, do not forget about the discounts that you receive at the parks! We use to forget all of the time or just weren’t aware of them and now we’re getting on top of them more and more each year! You can get discounts at Pandora, all of the merchandise stores, Starbucks, restaurants, at Disney Springs (previously known as Downtown Disney) and on hotels, I believe.. Here is a link to all of the Annual Passholder Discounts for you to browse at! We didn’t know until Christmas time, that you can get discount on the bottles of Coca Cola that you purchase but only at merchandise stores, not from the little kiosks selling snacks and refreshments around the park! 7. Disney Transportation and Parking – Take advantage of the free Disney Transportation System! There are buses that run from Disney Springs to all of the hotels, then from the Disney hotels they have buses that take you directly to the parks. In the past, we parked at Disney Springs if we were browsing around for a bit or getting something to eat and then we would hop on a bus to another park. I am assuming that Disney frown upon doing this as it will take up the parking at Disney Springs (which is now improving) but use this at your own risk, incase they put anything in place from now on! Also, again with your Annual Passes you will gain free parking into all of the theme parks if you show it at the main gate to the parking lot (this goes for Universal Studios, Sea World and Busch Gardens too!). Each year that I have visited Walt Disney World, we have seen the prices of parking shoot up! It use to be $12 when we visited around 2007/2008 and now it’s up to $20 per day for a standard size car. Anything larger is more expensive like a shuttle/limo/camper/trailer/RV..
8. Additional Discounts on Food Outside the Parks – Don’t forget to look through the coupon booklets that you will see everywhere in Orlando. At restaurants they will have stands of them and also at Tourist Offices and Ticket Sellers. 99% of the time, you will find a coupon for the big named restaurants such as Ponderosa, Golden Coral, Red Lobster, Crab Shack, Chick-Fil-A.. Most of these coupons will be 5-10% off your bill or a ‘Kid eats free’ voucher. I know it’s only small but if you add everything up from each day, you will see what a difference it makes! We like to write down how much we have spent each day and then we will use the extra money to splash out on gifts for ourselves or family and friends, any extra activities or restaurants we want to visit! I tend to join up to certain restaurants mailing lists too, for example at iHop they give you a free stack of pancakes on your birthday and usually other large events throughout the year like Pancake Day! 9. Snacks – I always highly recommend taking snacks with you wherever you go. As you will find out, the theme parks can be quite pricey for snacks although we do tend to purchase these as it’s easier than taking a bag. The snacks are really good at the parks and this is what we tend to spend on at the parks, but you can always bring your own in. We really enjoy going to Walmart and purchasing a huge 1KG bag of mini size Nerds, Laffy Taffy, Gobstoppers and Sweetarts. We also purchase things like Capri Sun’s to have at the hotel (they get a bit too warm in the car), cereal (always Lucky Charms to get those sugar levels soaring through the roof!) and fruit to eat in the morning at the hotel, cereal bars to easily take with us wherever we go and always bags of Cheetos as they are my favourite and you never know when you need to munch in the car! We basically just keep a carrier bag of snacks in the car, so we can eat them there or take them out somewhere with us. And I feel like that is it for now until some more tips come to my mind! I might end up doing a Part Two to this post if I find enough additional tips for you but if you have any questions then feel free to comment down below and I’ll reply to them! I really hope you enjoyed this post and I hope that it helped in some way for you all! Video: I Surprised My Mother at Disney! What am I looking forward to on Netflix 2017? As you might have seen from my previous blog post, that I was incredibly invited to a Netflix Event in Cardiff! I was extremely grateful for this opportunity and I think I am still a little shocked haha – so I want to quickly say a huge thank you to the team for having us there and we had an absolute blast! So, at this Netflix event we were shown some exclusive clips and trailers for upcoming shows for 2017 and believe me, they look incredible! Firstly, the one I am most excited for so far has to be 13 Reasons Why. This is actually being released on the 31st March which is actually tonight! I cannot wait! It is based on the book ’13 Reasons Why’ by Jay Asher which I have just noticed, I do not have a review of on my blog for some reason, when I thought I did.. Anyway, I will write one up for you all very soon! Seriously, this series is going to be HUGE! You definitely need to give it a watch, especially as I believe that it is going to raise so much awareness especially for the younger audience (this show is appropriate for an 16-25 year old audience, obviously it is suitable for all people at the same time but this is the target audience!). From the book, it really shows you that you might think that you’re doing no harm by saying something small to somebody, but in reality they might all add up to somebody else and they might have other things going on in their lives which contribute to issues like this! Go check out the trailer for 13 Reasons Why over at the Netflix website. The second series that I am so excited for is Mindhunter. All I can say is that the teaser trailer that I saw for it has got me instantly hooked already and I know that I am going to love this series! I believe that this one is being released later on in the year. Basically, the moral behind this is ‘To understand who is a psychopath, you have to become one yourself’. So definitely head over to the Netflix website and have a nose for yourself – I really don’t need to explain it in any more depth, you just have to watch the teaser for yourself. Here is a teaser for Mindhunter, it looks seriously good! So for my last choice, I feel like everybody can probably relate to this and that is the almighty Stranger Things. Let’s be honest, you have probably heard about this series about 10,000 times on Social Media, from friends, on blogs, reviews.. It is just an outstanding series that passes on some E.T and Goonies vibes for me, but with a lot of added weirdness and out of the ordinary things that happen. Here is the link to Stranger Things episodes on Netflix. Season One is already out and will get you hooked instantly, but the second series will be arriving around Halloween time so it gives you enough time to catch up on the hype! So there is a short insight into what I am looking forward to on Netflix in 2017 and I cannot wait for you all to get stuck in! Let me know what you are currently binging on at the moment and what you’re looking forward to – I would love to know! – What TV Series and YouTube am I watching? – Let’s Talk about Respect..